How would you like to design your StickerBook? Use our unique, modern design templates right out of the box or customise to suit your style. Print a different image on every single sticker at no extra cost – up to 90 different designs in a pack. Choose a snazzy StickerBook design and colour, or add your own logo for that personal touch. We offer print runs of just 90 Stickers – print what you want as you need it. 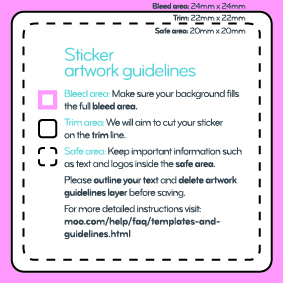 Make sure that your background extends to fill the bleed to avoid your StickerBooks having white edges when trimmed. This is where we aim to cut your stickers. Available in a range of sizes, paper stocks and finishes. Postcard envelopes are made from recycled paper and are available in 5 colours. Time to get all promotional. Big time. Because we’ve dropped the price on our full-colour, double-sided Postcards.